Prospective members of Scott’s Cheap Flights often ask us if the flight alerts we send members are for flights that are any good. Are the deals we’re telling them about on terrible airlines with exorbitant fees? Do these cheap flights have miserable routing with four stops and six-hour layovers? Nope. Never. 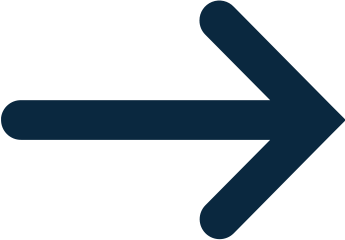 In fact, we only send deals that meet specific criteria. Among the requirements: a humane schedule and availability on reputable airlines. Sometimes those airlines are the big name legacy carriers like American, Lufthansa, and Qantas, and sometimes they’re budget carriers—but they’re always airlines we’d recommend to our parents (and we actually like our parents). It’s natural to be skeptical about some of these international budget airlines if you’ve never flown them before. If you’re searching for flights and getting rock bottom prices, you might feel there must be a catch. Sometimes there are catches, usually in the form of extra fees, but not all budget airlines are created equal. These are the best budget carriers offering cheap international flights from the United States. Norwegian services nearly 100 destinations from more than a dozen cities in the United States. Flights to Europe are the most plentiful, but they also offer connecting flights to a few farther-flung destinations like Morocco, Dubai, and Turkey. One thing to note: Norwegian has recently been having some financial trouble and has dropped some routes. There’s a lot of speculation as to what might happen in the future, but we’re hopeful they’ll continue operating as they have been, as there are a lot of things to like about the airline. Most of Norwegian’s planes are new, and they use 787-9 Boeing Dreamliners for many long-haul flights. Even in economy class, you’ll have a fairly comfortable ride. And they’re one of the few airlines that doesn’t charge exorbitant prices for one-way flights. Additionally, many of Norwegian's routes are direct (you're not stuck always going through their hub in Oslo) and many routes have free WiFi. You’ll get no frills with their basic LowFare tickets, but you will get a free personal item and a carry-on. Note that the dimensions for carry-ons on Norwegian are slightly smaller than a standard carry-on, however, Norwegian tends to be a bit less strict on enforcement than some airlines when it comes to carry-on size and weight. The cost of luggage depends on where you’re headed, but you can save up to 50% if you purchase ahead of time rather than at the airport. Like most budget carriers, Norwegian charges a lot of fees. A checked bag, meal, and seat selection bring the total to around $450, with 31% of the total cost in fees. Also, note than the checked bag fee is per leg (though the price is lower on flights within Europe), so if you're flying roundtrip and your route has a connection (for example: San Francisco to Rome with a stop in London), you have to pay for a checked bag on four total legs. Air Canada Rouge flies from more than 55 US destinations to more than 60 Canadian cities, as well as a few stops in Europe, Asia, and South America. Air Canada Rouge is fairly new, and their planes are formerly part of Air Canada’s fleet. They’ve been restyled to reflect the Rouge branding, and there’s no in-seat entertainment (download their app on a tablet or mobile device ahead of time), but otherwise they’re the same comfortable planes. In fact, you won’t find a whole lot of differences between flying Rouge and flying a regular Air Canada flight. Since they’re an arm of Air Canada, their customer service is the same and the flights are dependable. 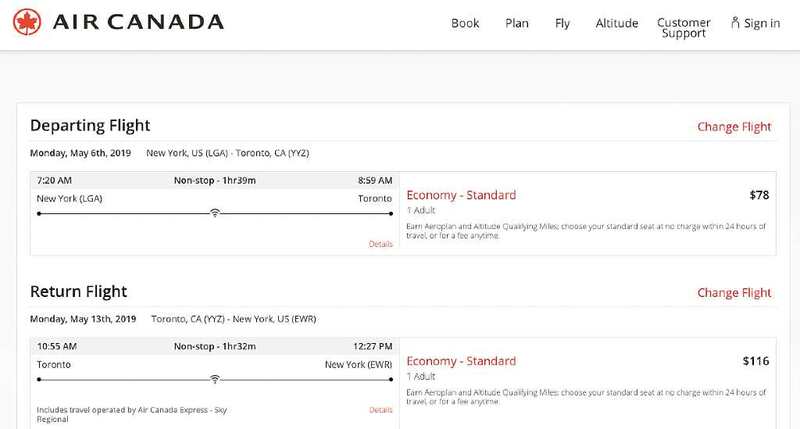 Booking three months in advance, a standard price for a roundtrip flight from NYC to Toronto is $192.82 ($78 outbound, return for $116) on a Standard Economy fare, which doesn’t include a checked bag. You can change your seat within 24 hours of your flight time, or select ahead of time for a fee. These additional costs add about an extra $60 per leg of your trip, bringing the total to around $312 (good, but not as good as the $174 fare we found in early January on AirCanada, Delta, American, and United, which would come to $234 with checked bag), with about 40% of your total cost spent on extra fees. A subsidiary of Iberia (Spain’s flagship carrier), LEVEL is a new European carrier with flights from Boston, San Francisco, and New York to Barcelona, and from NYC to Paris. 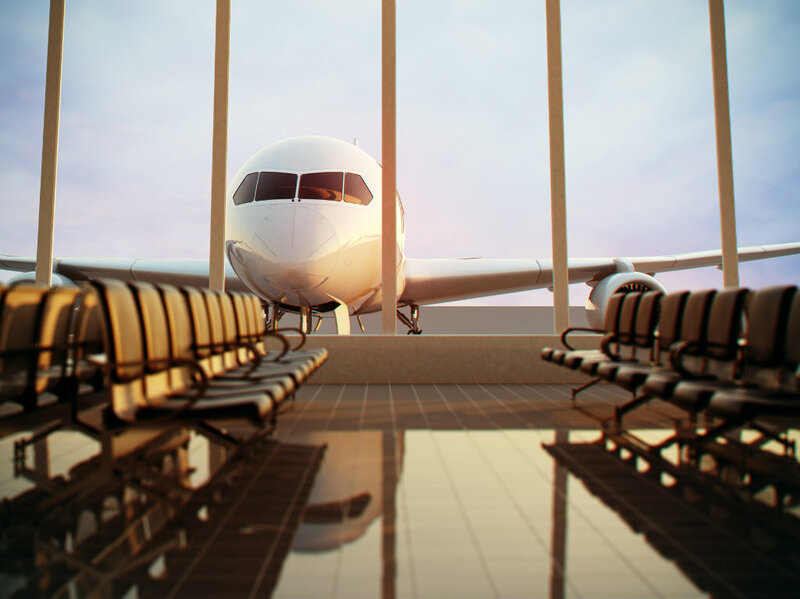 Since it’s a new airline it doesn’t offer as much flexibility when it comes to travel dates or airport locations, but prices are consistently cheap. The airplanes are modern and come with free entertainment systems. 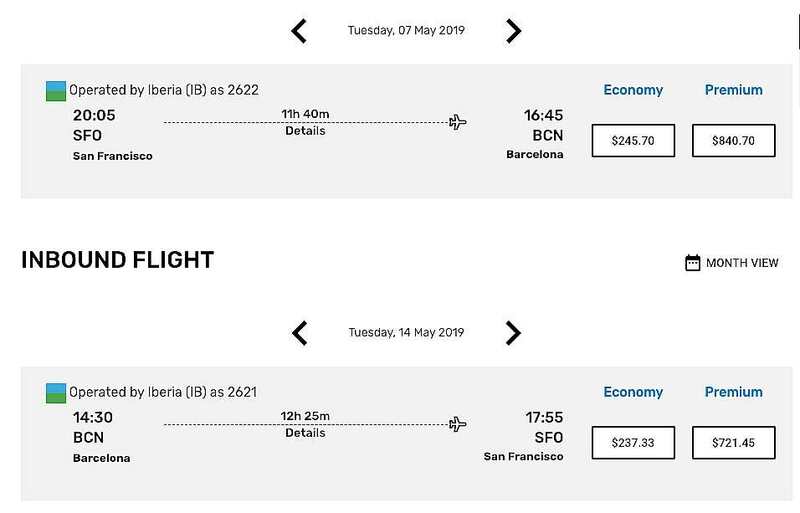 For May trips, we’re currently seeing flights from San Francisco to Barcelona for $483.03 ($245.70 on the outbound flight and $237.33 return). If you’re traveling with only a carry-on and aren’t picky about seats, the $483 fare is pretty good (but not as good as the $313 deal we sent to Premium members in September). But be aware that extra fees could add $78 per direction, accounting for about 24% of your total cost of around $640. JetBlue covers an enormous territory, with flights operating from dozens of US cities to Canada, three destinations in South America, and all over the Caribbean and Central America. JetBlue is unique to other budget airlines because even economy passengers get perks like snacks, beverages, free wifi, and in-flight entertainment. JetBlue’s seats are exceptionally comfortable, with above-average legroom. The airline has a Customer Bill of Rights which outlines what you’ll get in case there’s a delay or overbooking, and their Best Fare Guarantee means that if you find a cheaper JetBlue flight on another site on the same day, they’ll hand you a $100 credit. We saw standard roundtrip fares from Fort Lauderdale to Bogota for $295.03 in May. If you’re happy with a standard seat, the extra fees for baggage and a meal add at least $30 to each leg, bringing the total to bring your cost to around $355, with extra fees accounting for just 16% of the total cost. AirAsia X flies from Honolulu to nearly 30 destinations in Asia (with wider connections to over 165 destinations in 25 countries, including Australia and India). Flyers love AirAsia for its great customer service. It also has a great app where you can check in ahead of time and monitor your flight. 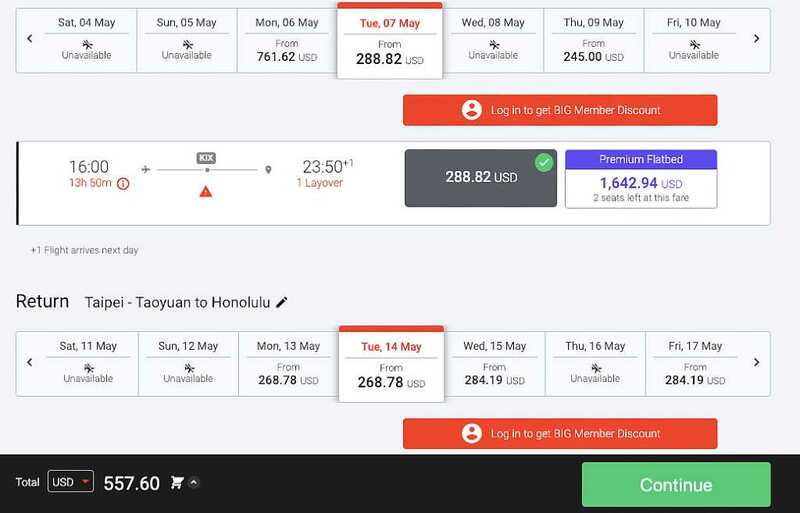 A search for flights in May brought up roundtrip flights from Honolulu to Taipei, Taiwan for as little as $557.60 ($288.82 on the outbound journey; $268.78 for the return). If we add basic seat selection to all legs of this itinerary, one meal each way, and one checked bag each way, the total jumps by nearly $200 to $729.56. About 22% of the final price is extra fees. There are some airlines that we generally don’t recommend. In fact, we don’t include these airlines in any Scott’s Cheap Flights deals that we send out. That doesn’t mean you should absolutely never fly them (see below for when you might want to consider it) but you should know what you’re getting yourself into. Note: We used to include WOW Air in this list due to its egregious fees, but the airline has since gone bankrupt and ceased operations. Frontier Airlines flies from nearly 100 U.S. cities to Mexico, the Caribbean and Canada (Calgary), but that quantity doesn’t come with quality. Many of their planes are old, their seats are uncomfortable, and legroom is below average at a scant 28 inches of pitch between seats. To top it off, there isn’t a lot of flexibility in destinations or dates (for example, the only direct route to Jamaica is from Philadelphia or Raleigh, with flights leaving about twice a week). They offer some of the lowest fares to and from their hub in Denver and occasionally have great sales, but often the prices aren’t that competitive, especially when you add in the fees. Looking at example flights from Philadelphia to Montego Bay, we found a fare of $371.57 roundtrip in May. For checked bags and carry-on it’s cheaper to pay in advance online rather than at the gate. With one piece of hand luggage, one checked bag, and seat selection, your total will be more than $514 roundtrip—that’s 30% fees, and you don’t even have the option to buy a meal. Scoot flies from Honolulu to more than 50 destinations in Asia, and touts incredible low fares (like $80 from HNL to Bangkok). However, the issue with Scoot is that the deal advertised can be quite different than the actual price—climbing as high as $965 return. 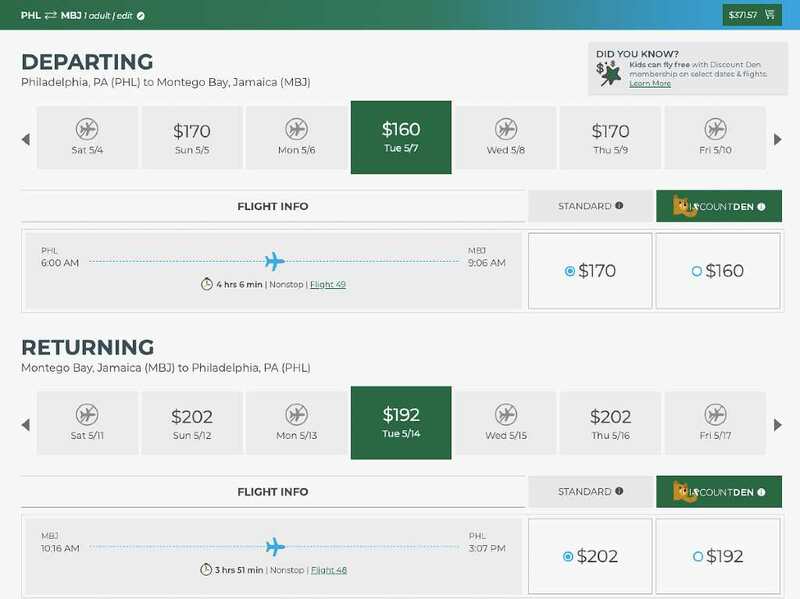 For example, the listed $80 fare is for a period of two weeks, but when you actually search dates within that period there are no low-fare flights available. 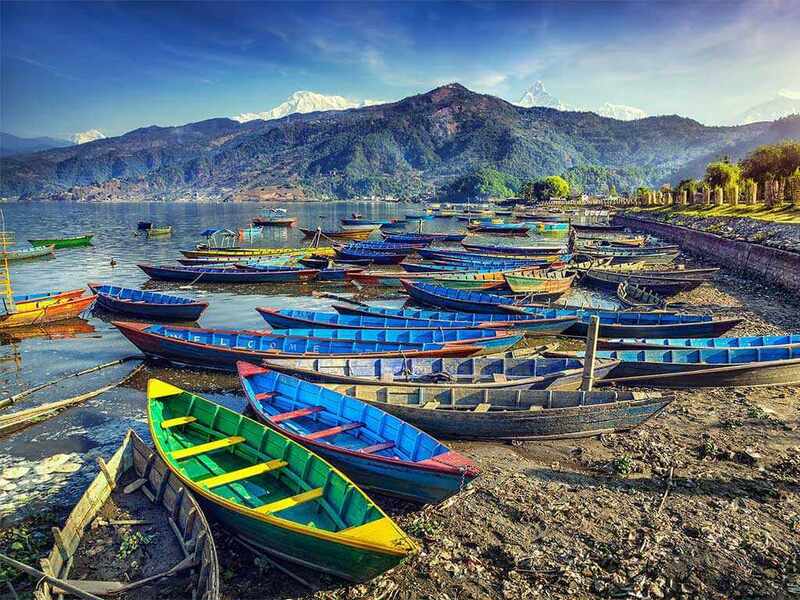 The next available dates list fares at $1,200+. Even if you’re searching a few months in advance, the fares aren’t great. At all. In this example, we found roundtrip flights in May at $1,187.22. This brings your flights total to over $1,300. The fees are only about 10% of the cost, but the cost is ridiculous. It would be a rare occasion to make flying Scoot better than AirAsia X. 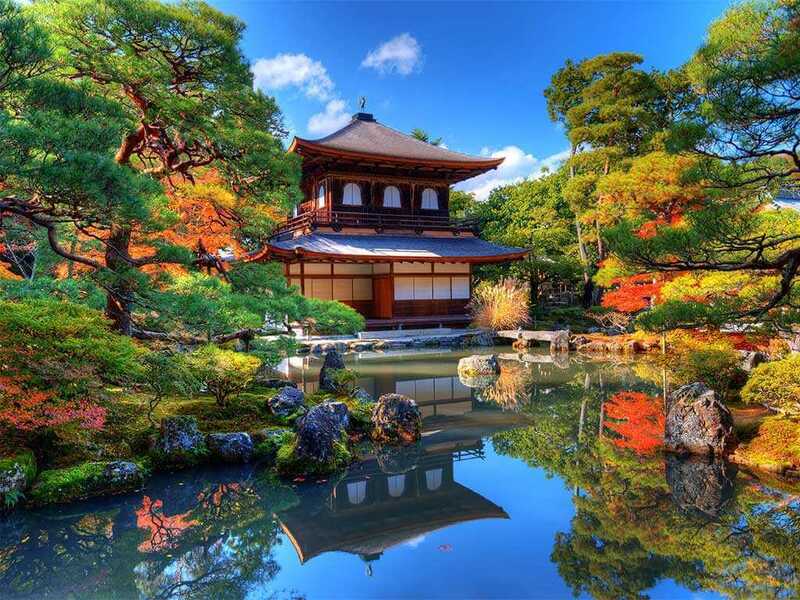 One big exception: they often offer solid deals from Honolulu to Osaka. Spirit Airlines is a US airline operating in 70+ destinations throughout the United States, Central America, the Caribbean, and South America. 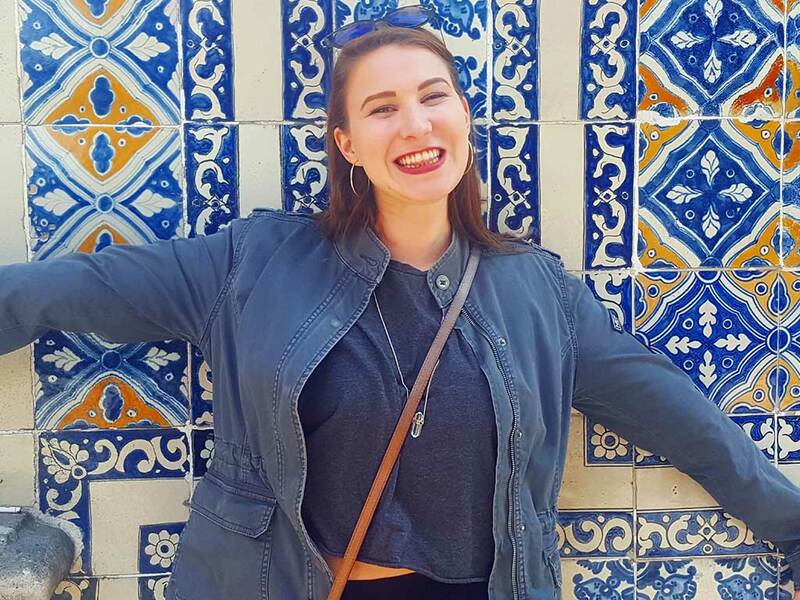 The overall experience is often compared to Ryanair; customer service isn't great, flights are often delayed, and you will be nickeled and dimed at every turn. Additionally, seats on Spirit have very little legroom (just 28 inches of pitch, the same as Frontier) making for an uncomfortable ride on anything but the shortest flights. 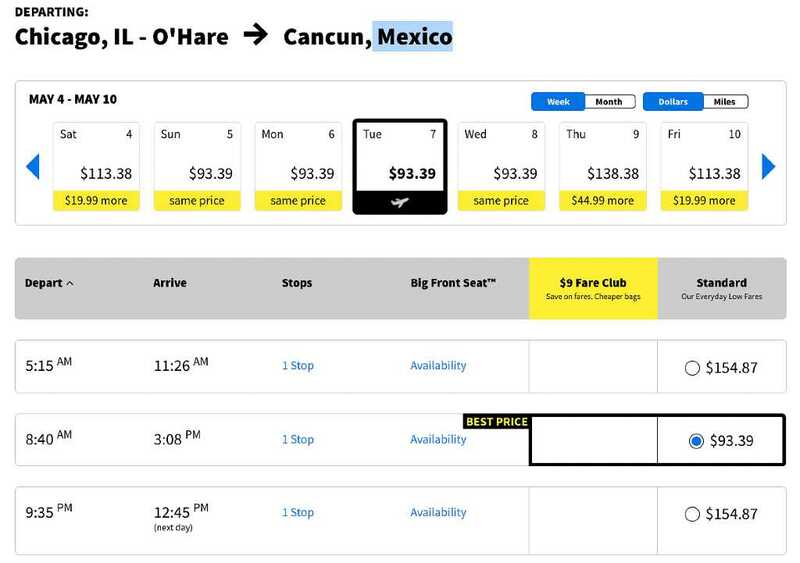 We found flights in May from Chicago to Cancun for $195.52 roundtrip ($93.39 on the outbound trip and $102.13 return a week later). Spirit Airlines’ fees include a personal bag, but not a carry-on. With those additions, your flight will be more than $330, about 38% of which is fees. To be fair, that’s not terrible (but not as good as the $183 deal we sent in November, which rises to $283 with carry-on, checked bag, and seat selection on America, Delta, or United); but you’ll get zero other inclusions: no water, no snacks, nothing. There is no in-flight entertainment. You can use the bathroom for free. That’s about it. Sun Country is a US-based airline operating 86 routes between the United States, Mexico, Central America, and the Caribbean. Sun Country’s customer service leaves a lot to be desired—the airline made headlines last year when the last seasonal flights out of Los Cabos were grounded and Sun Country did not schedule any other planes to pick them up. Flights were refunded, but passengers were forced to reschedule on another airline. Sun Country has reportedly cleaned up its act since then, but the damage is done. 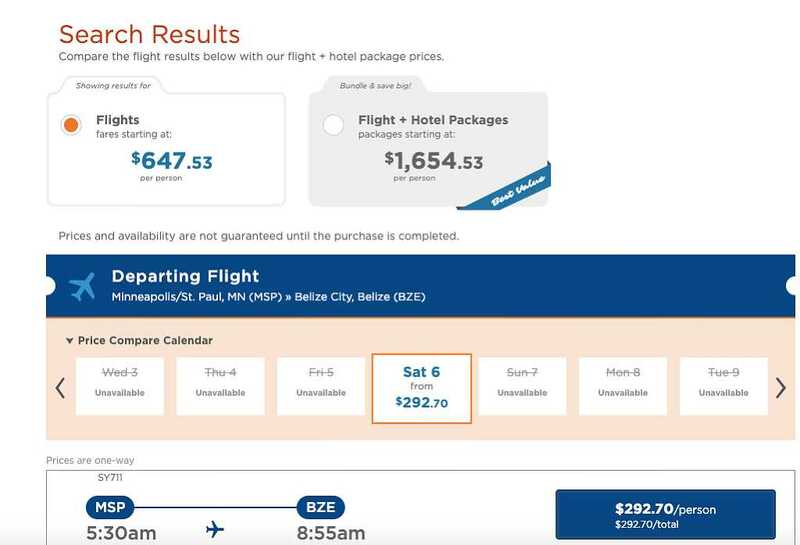 There’s not much flexibility in dates, and prices aren’t exceptionally cheap; for example, a flight in May from Minneapolis to Belize City goes for $647.53 roundtrip, and flights operate only once a week. With all those options, the flight total is $725.53; no contest with the $274 deal we sent last June (even if you add checked bags and bring the total to $324). Note: You have to either check a bag, or bring a carry-on. You can’t do both. If your family of four is traveling on a long-haul flight and you’re going to want to sit together, travel with one checked bag each, and enjoy some in-flight snacks and entertainment, you’re probably going to want to pay a bit more to fly a carrier that includes luggage, seat assignments and meals (or offers them for a reasonable fee) as all those extra charges will add up. If you’re traveling on a long-haul flight, where those additional costs like seat selection and checked baggage make more of a difference in comfort. For example, if the only way you can get some shut-eye is by leaning against a window, then it’s probably worth the splurge for you to pre-select a window seat. You’re already aware that you’ll want to splurge on those little “luxuries” like snacks and water, which may not seem like a big deal until you’re bored or hungry in the sky. Suddenly you find yourself forking over $50 for sloppy airplane meals and overpriced drinks. Another caveat to budget airlines—and this applies to all, both good and bad—is that unlike the larger legacy carriers, they may only run a few flights per day or week, and they aren't part of any airline alliances and don't have any interline agreements with other airlines. For example, if you miss your flight with Air France, which does have these agreements and operates a lot more flights and routes, they may be able to put you on a flight later that day, or they might be able to work with a partner like KLM, Delta, or Virgin Atlantic to get you where you need to go. But if you miss your flight on a budget a carrier with no partners and a limited schedule, they can't move you to a flight on another airline, and if they don't have another flight scheduled for a few days, you might miss out on a large chunk of your vacation. Ultimately: If you’re a single traveler on a short flight, traveling with a small carry-on, and you don’t mind bringing your own snacks and entertainment and squeezing into a middle seat, you may be perfectly content with a bare bones, ultra-cheap flight with zero frills. In fact, several Scott’s Cheap Flights staff members have flown these “bad” airlines when saving a few bucks outweighed the potential negatives. As always, consider the pros and cons (and fees) and balance those against your specific needs to decide what's right for you. 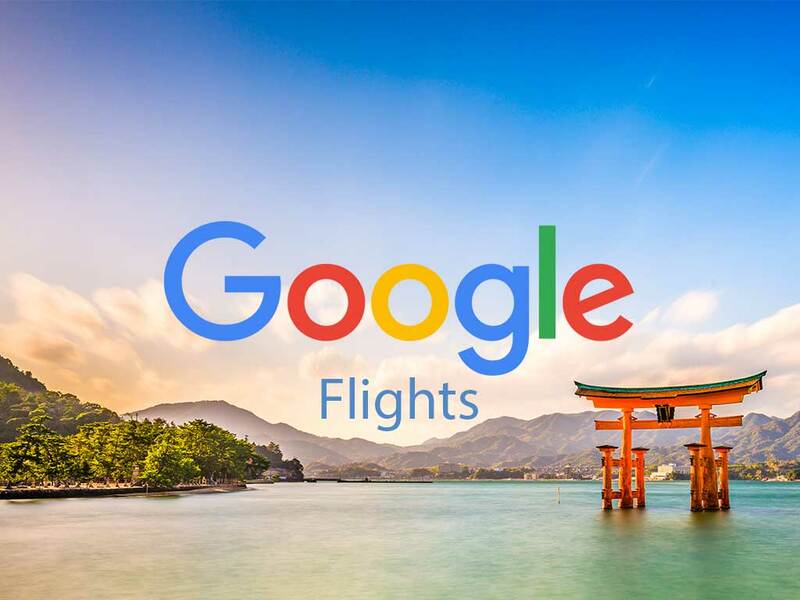 Read more tips in our Ultimate Guide to Cheap Flights, and start your free trial of Scott's Cheap Flights to get alerts for cheap flights sent right to your inbox.